Rising Nationalism: As Young US Matures, the Art of Coin Making Advances. A proud spirit of nationalism swept across the United States during the early 1800’s, as the Louisiana Purchase, the Barbary pirates tussle (America's first stand against international terrorism), and the War of 1812 helped shape the geographical and political identity of the newly created nation. Meanwhile, the Industrial Revolution advanced the art of coin making. The "Coins & History Chapters" button at upper right opens up other units in our US Coins & History section. The links directly below are sub headings in the "Rising Spirit" chapter. 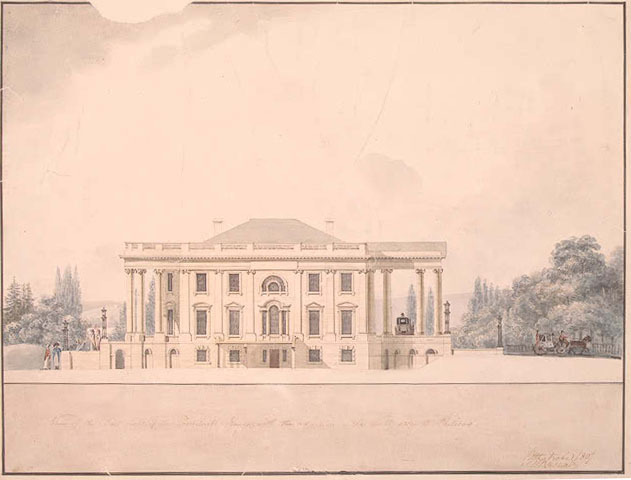 The White House, as is appeared in Thomas Jefferson's time. 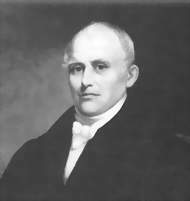 Jefferson appointed Benjamin H. Latrobe to upgrade the structure's appearance. Latrobe added porticos , transforming the White House from a simple rectangular block to a building recognized throughout the world as the home of the President of the United States. Image courtesy of Library of Congress. When Thomas Jefferson took the oath of office on March 4, 1801, the first presidential inauguration ever held in the new capitol city of Washington, D.C., it marked the beginning of many years of Republican control of the federal government (recall that Jefferson's Republican party was not the modern day party known by the same name, but was actually the forerunner of today's Democratic Party). Many of the outgoing Federalists feared Jefferson would reverse all their policies, but Jefferson's harmonious inaugural address allayed those fears and provided a fresh start to his administration. Under Jefferson and his hand-picked successors, the size of the United States multiplied in size. Hundreds of thousands of pioneers forged west into Kentucky and Tennessee along the Wilderness Road, a trail first blazed by explorer Daniel Boone. Further north, the treacherous Ohio River floated adventurous American families closer to the heart of the continent. 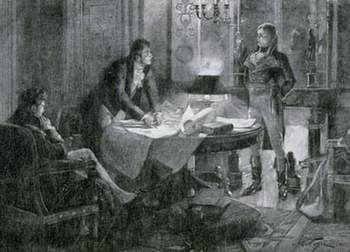 Napoleon Bonaparte, (at far right) consults with his advisors, Tallyrand and Marbois, over the possible sale of the Louisiana Territory. After weighing his options, Napoleon decides his best choice is to offer the land to the Americans. Original artist Andre Castaigne. Public domain image. As fate would have it, an incredible opportunity fell into Jefferson's lap. In May, 1801, The United States discovered that Spain had quietly turned over the Louisiana Territory, a vast area between the Mississippi River and the Rocky Mountains, to Napoleon, the dictator of France. Concerned that Napoleon was planning to re-assert French power in North America, Jefferson considered forming an alliance with Great Britain, who shared in the desire to curtail Napoleon's ambition. At the same time, he dispatched James Monroe to Paris to join with the American ambassador Robert Livingston to negotiate the purchase of New Orleans and western Florida, a move Jefferson hoped would diffuse a potential conflict. On the eve of his meeting with Monroe and Livingston, Napoleon had come to the realization that his plans for a powerful North American presence were futile. The French strongman had just received news that his attempt to recapture the West Indies island of Santo Domingo was resulting in heavy troop losses. France had lost control of the colony in Haiti (on the western half of Santo Domingo) in 1791, when black slaves, under the leadership of Toussaint L'Ouverture, successfully revolted against their French taskmasters. Without Santo Domingo, Napoleon had no place to stage a military operation in the New World. Moreover, he decided to focus his full attention on the conquest of Europe. In light of these circumstances, Napoleon decided his best course of action was to sell the entire Louisiana Territory to the Americans and salvage what he could out of the deal. 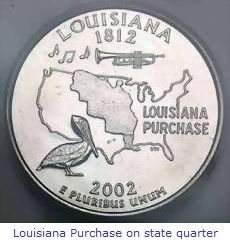 The Louisiana state quarter design in 2002 depicts the vastness of the Louisiana Purchase. Acquired by the United States in 1803, the territory doubled the size of the nation. Louisiana itself became a state in 1812. Imagine the amazement of Monroe and Livingston when Napoleon made his unexpected offer. For 15 million dollars (in other words, about three cents an acre), they could double the size of the United States and secure a permanent outlet to the Gulf of Mexico and easier access to world markets. With no time to consult with Jefferson, the American diplomats quickly closed the deal on April 30, 1803. In October that same year, the Senate formally approved the treaty, thus concluding one of the greatest real estate bargains in history. The Louisiana Purchase, with its immense size and rich resources, ensured that the United States would one day take a place among the world's great powers. Jefferson then appointed Meriwether Lewis and William Clark to lead an expedition over the Louisiana Territory to the Pacific Ocean. Jefferson instructed Lewis and Clark to find navigable waterways, keep careful records about the soil, climate, minerals, and fauna, collecting samples whenever practical. They were also expected to document encounters with Indian tribes, search for overland passages, and to be on the lookout for fur trading opportunities. With orders firm in hand, the Lewis and Clark expedition departed St. Louis on May 14, 1804. 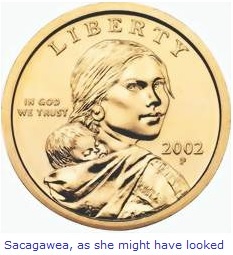 Sacagawea, with her infant son Jean-Baptiste, is immortalized on a $1 coin, released into circulation beginning in the year 2000. Along the way, the expedition hired a young Shoshone Indian woman named Sacagawea to be their guide and interpreter. Sacagawea helped them build a friendly relationship with the Shoshone tribe, who in turn provided horses for Lewis and Clark and their men. The horses were critical assets to the explorers, helping them cross rugged mountain ranges and finally, to the shores of the Pacific Ocean. The Lewis and Clark expedition ended 28 months after it began, a resounding success which greatly enhanced knowledge of the West. Since then, the lore surrounding their mission has elevated Lewis and Clark to near legendary status. Retrace the steps of the famous explorers through the words of Stephen Ambrose's Lewis & Clark: Voyage of Discovery. Ambrose offers an insightful modern day viewpoint on one of the most important events in US history, taking the reader from the present to the past at each point of the journey. This is an approach you won't find in many school lesson plans. The author presents interesting facts on the land, climate, wildlife, and Native Americans encountered by Lewis and Clark and their courageous supporting cast. This work pays homage to the indomitable American spirit, backed up by an array of "goose bump" photography. Get a copy for your living room coffee table. Your visitors will be impressed by your exquisite tastes and knowledge of American history! Read about the daily adventures of the famous expedition in Guide to the Lewis & Clark Trail. In celebration of the bicentennial of Lewis and Clark's epic journey, the folks over at National Geographic have compiled a magnificent DVD-book combo (also available in VHS). Relive their incredible story of exploration and discovery of the raw American frontier. Lewis and Clark: Great Journey West provides breathtaking imagery of the unknown, filled with beauty and danger, much in the same way it must have appeared to Lewis and Clark. A fantastic visual treat, the same footage was shot for IMAX theatre viewing. The companion paperback, Guide to the Lewis & Clark Trail, has a day-by-day account of the explorers' odyssey, complemented by maps, vivid photos, and illustrations. Neither the DVD or book are overwhelming in length, so younger kids stand a chance of maintaining a high interest level throughout. As Thomas Jefferson squeaked into office following the election of 1800, he stressed the importance of avoiding foreign entanglements. But when American rights were challenged internationally, Jefferson had little choice but to respond with military action. In defending the honor of the youthful United States in the face of the Old World aggression, American heroes were born, building pride and a sense of national identity throughout all sections of the growing nation. Lieutenant Stephen Decatur, center, battles a pirate while boarding a Tripolitan ship on August 3, 1804. Midshipman Thomas Macdonough, who later distinguished himself in the War of 1812, is also seen in action. Image courtesy of U.S. Naval Historical Center. For several hundred years, pirates of the Barbary States of Morocco, Algiers, Tunis, and Tripoli on the northern African coast preyed upon merchant ships sailing the Mediterranean Sea. Instead of confronting the pirates (perhaps best described as the 19th century's version of terrorists), the European governments simply paid tributes (i.e. extortion money) to them in exchange for "protection". 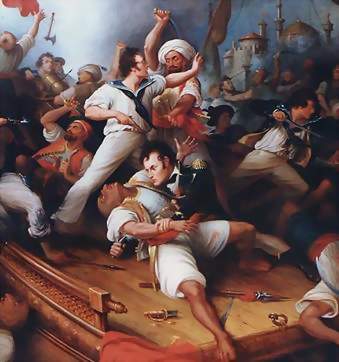 The United States, too, paid tributes, but in 1801 when the Barbary pirates demanded more money, the Americans refused. The Tripoli rulers responded angrily, cutting down the flagpole of the American consulate and declaring war on the United States. 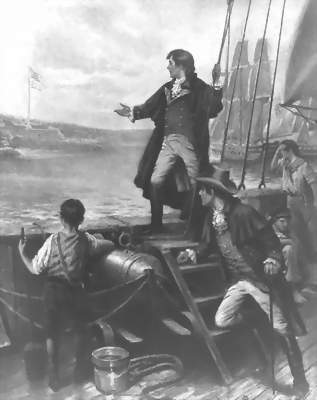 President Jefferson, vowing that this indignation would not stand, sent a squadron of naval ships, led by Commodore Edward Preble, to engage the enemy at Tripoli. Over the next four years, the American navy racked up a series of impressive victories, but it was the exploits of Lieutenant Stephen Decatur that won the hearts of his countrymen. On a night in February 1804, Decatur and a handful of skilled sailors secretly infiltrated the pirate nest at Tripoli and boarded the Philadelphia, a US warship that had been captured by the pirates. Decatur and his men set the ship ablaze, and escaped unharmed through a withering storm of gunfire, all returning safely to their base. Equally daring was the mission of American diplomat William Eaton. Leading a small contingent of United States marines and mercenaries across the Egyptian desert to the shores of Tripoli, Eaton and a few good men took out a major pirate fortification at Derna in 1805. Faced with these setbacks, the Tripoli rulers agreed to peace terms with the Americans, dropping their demand for tribute payments. The piracy of other Barbary States continued for years. In 1815, another American fleet, this one under the command of an experienced Decatur, teamed up with European warships to put a final end to the extortion racket of the Barbary pirates, with a frightening show of force at Algiers. American merchants, as well as those of other nations, were now free to sail the Mediterranean without fear of the pirates. Europeans viewed the United States with new respect and admiration, for leading the charge against the Barbary States menace. On the home front, the American people were instilled with a feeling of national unity and accomplishment following the Barbary surrender. The United States found itself embroiled in yet another foreign entanglement in the opening years of the 19th century. To no one's surprise, hostilities did break out between Great Britain and Napoleon's France in 1803. American goods flowed into both countries during the war, but it was the French who were especially dependent upon the American shipments. With this in mind, the British navy began intercepting American ships and confiscating their payload. By 1807, more than 1000 American vessels had been seized (the French interfered with American shipping likewise, but on a much smaller scale). 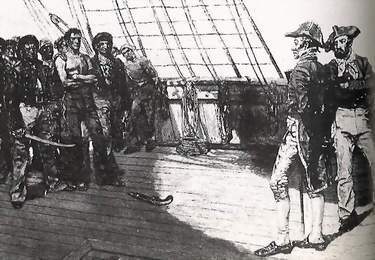 A tense moment, where a British officer looks over the crew of American merchantmen, supposedly searching for deserters from the Royal Navy. Deeply resented, Britain's overbearing impressment policy helped instigate the War of 1812. Image courtesy of Library of Congress. Another source of irritation between the United States and Great Britain was impressment, or the kidnapping, of American sailors on the high seas, for induction into the British navy. Ostensibly, the British were trying to hunt down deserters from their navy, but that was mostly just an excuse to condone their actions. In all, nearly 10,000 American crewmen were pulled off their ships in this manner. The most notorious example of impressment was the Chesapeake-Leopard incident, where three Americans were killed and eighteen wounded. Many outraged citizens demanded war in response to this affront to America's sovereignty. Following an ill-advised ban on shipments to foreign countries, President James Madison tried to resolve these contentious issues diplomatically, but achieved little. What's more, trouble was brewing with the Indians on the northwestern edge of the country. A fresh crop of "War Hawk" congressmen from western states, including Henry Clay of Kentucky, accused British agents in Canada of inciting Indian resistance against American frontiersmen, an act they clamored justified war. In addition to wanting to quell the Indian uprising, the War Hawks also saw the possibility of annexing British Canada, along with its lucrative fur trade. And to the south was Florida, a Spanish possession that nonetheless could be brought into the American fold because Spain had been a close friend of Britain ever since Napoleon attacked Spain. James Madison, 4th President of the US. Because of his key role in writing the Constitution, he is called the "Father of the Constitution". After reluctantly asking for a war declaration in 1812, Madison is credited with seeing the country through the test. Image courtesy of White House archives. Bowing to the rising spirit of national pride, Madison asked for a congressional declaration of war against Great Britain, and got it on June 18, 1812. Most historians concur the war was fought principally over freedom of the seas and retaliation for the impressment of American seamen, with the less mentioned, but very important, desire to expand the boundaries of the United States. Probably because the reasons underlying it were so varied, the conflict was simply named after the year it began: The War of 1812. Strangely enough, on June 16, two days prior to the American declaration of war, Parliament had voted to repeal their policy of interfering with American trade, but in those days before telephones and e-mail, Congress did not learn of the British concession until much too late. Soon after the war started, it became quite clear the country was not prepared to fight. The navy's dozen or so ships was helpless when compared to the hundreds of warships in the British navy. The army and state militias combined had less than 7000 troops, most of them poorly equipped. Worse of all, American support for the war was badly divided. Anti-war sentiment was strongest in the northeast where New England merchants realized the war would destroy what remained of their European trade. What's more, they reckoned, if the United States was successful in annexing Canada and Florida, their representation in Congress would be diluted with the admission of new states to the Union. Thus, it was less than ideal circumstances under which the Americans endeavored to take on the British for a second time. The first major campaign of the War of 1812 was the planned US invasion of Canada. This strategy backfired disastrously because of poor strategy and organization, loosing Detroit to the British and their Indian allies, led by the Shawnee chief Tecumseh. Further to the east, the Americans did not advance beyond the Canadian border because the New York militia refused to extend themselves beyond the confines of their state. Commodore Perry leaves his severely damaged flagship, the USS Lawrence. Rowing through heavy gunfire to board the USS Niagara, he takes command, then goes on to soundly defeat the British fleet. The youngster tugging at Perry's uniform is his brother, urging him to sit down and take cover. Artist William H. Powell's masterpiece hangs in the US Capitol. Image courtesy of US Senate website. In September 1813, US forces regained Detroit and took control of the Great Lakes following a crucial naval victory on Lake Erie. The commander of the American fleet, Commodore Oliver H. Perry, famously reported to his superior officer, future president General William H. Harrison, "We have met the enemy, and they are ours". These words are held in high esteem to this very day as an honored chapter in American naval tradition. As the British-Indian coalition abandoned Detroit, Harrison chased them into Canada, finally catching up with them at the Thames River, where the British were defeated, and Indian leader Tecumseh was killed. On the high seas, small individually owned ships called privateers, operating with the consent of the US government, managed to annoy British shipping, but eventually the superiority of the British navy began to assert itself. By early 1814, few American vessels dared venture into the Atlantic. Following the defeat of Napoleon in Europe (but before his escape from Elba and his final Waterloo), additional British resources in Europe were available to commit to the war against the United States. Knowing this, the British high command planned a three-front offensive for late summer 1814. One was to sail to the mouth of the Potomac and assault Washington, D.C., and generally create as much havoc and destruction throughout the area as possible. The second front was to strike at the Americans by advancing south from Canada along the same waterway route General Burgoyne had taken during the Revolution. And thirdly, a large force was sent to capture the southern port city of New Orleans. 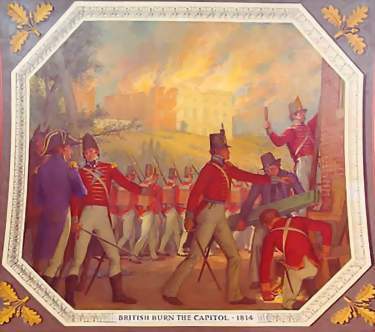 British soldiers set fire to US government buildings in Washington DC. The US Capitol in the background is fully engulfed in flames. A sudden heavy rainstorm saved the buildings. Image courtesy of The Architect of the Capitol. As planned, a large British force sailed into Chesapeake Bay, and after casting aside token resistance, their landing parties entered Washington D.C. on August 24. President Madison and other government officials had already safely escaped into the countryside. Before evacuating the White House, First Lady Dolley Madison removed the Gilbert Stuart portrait of George Washington, to prevent it from falling into enemy hands. The British then set fire to the White House, the Capitol, and other public buildings before moving on. Fortunately for the Americans, a heavy rainstorm quenched the fires before catastrophic damage was done, allowing many of the buildings to be rebuilt. After leaving Washington, the same group of Brits fixed their sights on Baltimore. Guarding the entrance to the city's harbor was Fort McHenry, an obstacle the British would have to overcome to launch their ground foray. In spite of the heavy naval bombardment beginning September 13, 1814, the American defenders at Fort McHenry fiercely refused to surrender. Francis Scott Key beholds the American flag still flying over Fort McHenry at dawn, September 14, 1814. Inspired by the sight, Key pens the "Star Spangled Banner", later to become the national anthem of the United States. Image courtesy of Library of Congress. A young lawyer and poet named Francis Scott Key witnessed the entire spectacle as a prisoner aboard a nearby British warship. The rockets' red glare reassured Key during the nighttime hours the U.S. flag was still there. While still dark, the bombing suddenly stopped, followed by an uncertain silence. Upon seeing the flag still flying at dawn, a sure sign the Americans had held out and not surrendered, Key jubilantly jotted down several verses on the back of an old envelope, and called it the "Star Spangled Banner". This, of course, became the words to the national anthem of the United States, officially recognized in 1931. The British attack from the Canadian north was thwarted by a stunning American naval victory near Plattsburg Bay on Lake Champlain. Captain Thomas Macdonough's decisive leadership turned back a force of 10,000 troops, preventing an invasion of New York. The Battle of Lake Champlain turned out to be the final confrontation before the War of 1812 officially ended. Negotiations for peace between the British and Americans had been underway for some time at the Belgian city of Ghent, at last reaching an agreement on December 24, 1814. Before news of the treaty crossed the Atlantic, the Americans achieved their most outstanding victory of the war at New Orleans. On January 8, 1815, General Andrew Jackson and a motley crew of 5400 woodsmen, sailors, pirates, "free men of color", and regulars, encountered an army of 8000 Redcoats under the command General Edward Pakenham. 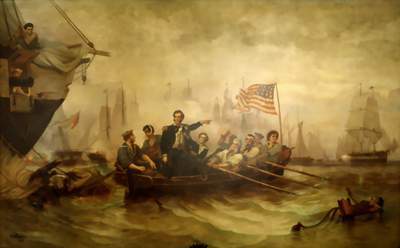 General Andrew Jackson oversees the defense of New Orleans against British attack, January 8, 1815. Jackson's resounding victory in the war's largest battle propelled him all the way to the White House in 1828. Image courtesy of National Archives. Shielded behind a water-filled trench and cotton bales, the Americans patiently waited as the British made their charge across a barren field, finally opening fire at point blank range. Wave after wave of Redcoats were mowed down as they tried unsuccessfully to penetrate Jackson's defenses. When the smoke finally cleared, Pakenham and about 2000 of his veteran troops were dead. The American casualties totaled no more than 21. The Battle of New Orleans instantly made Andrew Jackson a national hero, greatly boosting his future political fortunes. Even though the Battle of New Orleans had no influence on the Treaty of Ghent, the convincing triumph in the war's largest battle gave the American people the impression that they had won the War of 1812. The Treaty of Ghent resolved none of the issues that led to the War of 1812. There was no mention of the impressment of American seamen or about neutral rights in international waters. The treaty restored all occupied territory to pre-war borders, and arranged for the release of all prisoners of war. The treaty read more like a cease fire agreement than anything else. Most importantly, the treaty brought peace, something Americans welcomed, and provided for a commission to settle future disputes between the United States and Great Britain. Within a few years, many issues left on the negotiating table at Ghent were peaceably resolved, greatly improving relations between the two countries. What's more, these agreements built the framework for a lasting bond between the United States and Great Britain that has withstood the test of time. Today, Great Britain is considered America's most loyal friend in a world filled with danger. 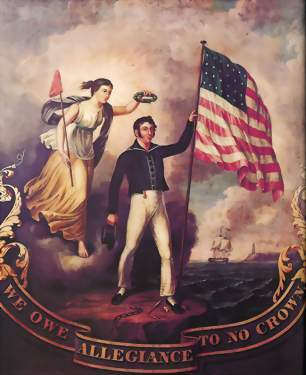 The "WE OWE ALLEGIANCE TO NO CROWN" banner was a popular symbol of American pride for many years following the War of 1812. Public domain image. As we look back at the War of 1812 from the perspective of the 21st century, we realize that even though the conflict essentially ended in a draw, it marked a turning point in American history. Prior to 1815, it was events in Europe that largely dictated United States policies, especially with foreign affair dealings. Following the Treaty of Ghent, the United States became much more insulated from Europe, and for the next 100 years, managed to avoid direct involvement in other European wars. With European concerns behind them, the American people turned their attention to the exciting challenge of opening up new western lands and expansion. Fighting the pirates of the Barbary States and the War of 1812 created among the people a rising spirit of nationalism and unity. In the minds of many, the United States had taken on a personality unique to itself, that is, an "American identity". As proud citizens of a self-governing sovereign nation with unlimited potential, Americans viewed themselves as worthy players on the world stage. Internationally, the young feisty nation grew in stature for daring to declare war against a great naval power when its rights were threatened, and then holding its own after hostilities began. More respect accrued, although grudgingly, in 1823 when President James Monroe announced a cornerstone foreign policy statement. This 1812 half dollar is a tangible link to long ago American history. Who knows, this coin may have been spent in Baltimore as Francis Scott Key wrote "Oh say can you see...", or maybe it was in Andrew Jackson's pocket as he fought off the British at New Orleans. The possibilities are endless! Photo courtesy of Ira& Larry Goldberg Coins & Collectibles, Inc., Beverly Hills, CA. The Monroe Doctrine, as it came to be called, was a direct warning to the Europeans to stay out of the Western Hemisphere. Any incursions into North, Central, or South America would be regarded by the American government as a hostile action against the United States, and would be dealt with accordingly. The issuance of the Monroe Doctrine was further evidence of a growing tide of American strength and unity. James Monroe served in the Continental Army under George Washington, and was the last American president directly connected to the Revolutionary War. Thus, before passing the mantle of leadership on to a new generation, Monroe made clear to all that the United States was determined to retain its hard-won independence and would forever be the master of its own destiny. Samuel Slater was only 21 years old when he arrived in America from England, bringing with him the technology to build power-driven machines for spinning and weaving cloth. The "Father of the American Factory System", Slater died a very wealthy man. Public domain image. The Industrial Revolution can be described as the modernization of manufacturing and industry, beginning in the 1700's in England, with the invention of water-powered driven machinery. Water-powered mills were first used for grinding grain, sawing wood, making cloth, and producing iron. By the 1790's, steam-powered engines had mostly replaced water power in English mills. As the revolution built momentum, more and more manufacturing was done in larger factories and less done in homes and small shops. With the landing of Englishman Samuel Slater at New York in 1789, the Industrial Revolution spread more rapidly in America. Under Slater's expertise, America's first profitable textile factory was opened at Pawtucket, Rhode Island in 1793. Soon, many other factories were built, mostly in the northeastern United States, manufacturing not only textiles, but a wide range of other products, including firearms, clocks, and watches. As the first decades of the 19th century passed, the Industrial Revolution changed the face of the United States. Far flung regions were tied together with a network of steel railroads and locomotives. Productivity boomed as new technology provided entrepreneurs with laborsaving inventions, more effectively utilizing the nation's rich forests, soils, and waters. Scientists conquered diseases, and other everyday problems were ingenuously solved. In many respects, the Industrial Revolution improved the lives of most Americans. The first steam powered coining press employed at the Mint, in 1836. Power to turn the press was supplied by a belt from the steam engine. THE original press, in working condition, is on display at the Franklin Institute of Science Museum, in Philadelphia. Image originally published in Harpers Weekly, June 19, 1880. Public domain image. The Industrial Revolution finally arrived at the Mint in 1816, when a steam engine roller was purchased to replace horse-driven equipment, destroyed in a fire in January of that year. Another benefit of upgrading the machinery was that the services of a stable boy were no longer required at the Mint. No doubt the removal of the horses was a welcome relief to the olfactory senses of Mint employees required to work in close proximity to their equine co-workers! In 1833, the Mint relocated to a much larger, architecturally superior building. 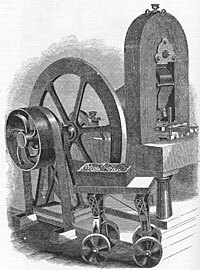 In 1836, a steam powered coining press was put into service, replacing the hand-powered screw press, dramatically increasing the rate of coin production to about 100 coins a minute, at least tripling productivity. The viability of the United States coinage system took a quantum leap in the 1830's, thanks to congressional action. In 1834 the weight standard of gold was reduced, a move which helped to alleviate the exportation of American coins, and had the effect of placing our money on a gold standard. 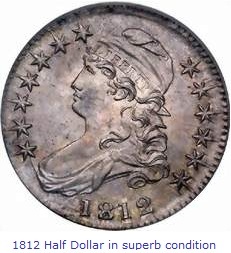 The passage of another act in 1837 set new legal standards, mint charges, legal tender, mint procedures, tolerance ranges in coin weights, accounting methods, a bullion fund, standardization of silver and gold coins to .900 fine, as well as other helpful provisions. As the Mint began to get a firm foothold, population centers arose further west, in part due to the discovery of gold in Georgia, and later in California. After years of fighting to survive, coining operations were now ready to leave the embrace of the Philadelphia "Mother Mint", to serve the needs of a growing, thriving nation.